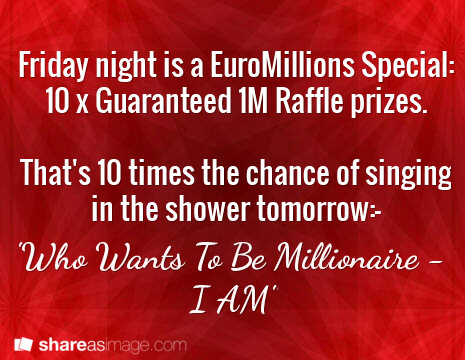 Friday night is a EuroMillions Special with 10 x Guaranteed 1M Raffle prizes. So get yourself a ticket today. Or if you want an even better chance of winning, then grab a spot in a EuroMillions syndicate today. Our reviews sections gives plenty of choice of who to play with. And most are open to players all over the world — and will let you join online in time to be playing in this special draw.